Situated between notable Chinatown and the Central Business District, Singapore City Gallery is a three story guest focus which houses a huge model imitation, giving guests a total perspective of the Central Area of Singapore. It likewise demonstrates the city's physical change past, present and future. Earlier known as the URA Gallery, it was built up in January 1999, and is presently still oversaw by the Urban Redevelopment Authority (URA), a statutory board under the Ministry of National Development, whose part is to arrange and encourage Singapore's long haul arrive utilize and physical improvement. The Gallery intends to exhibit Singapore's physical change in the most recent 50 years to wind up "a standout amongst the most liveable urban communities in Asia." It additionally expects to clarify what "forward-looking like, long haul and incorporated land utilize arranging and association amongst private and open segments is accomplished" in Singapore. The Gallery likewise displays "innovative answers for adjusting diverse contending needs, the some live, work, play openings got ready for, broad preservation endeavors and urban outline procedures to make a more particular Singapore. The display, which had an underlying expense of 4.2 million Singapore dollars, was opened on 27 January 1999, by Lim Hng Kiang, who was National Development Minister at the time. The display was at first anticipated to pull in 36,000 guests a year over the initial three years of its reality, a large portion of whom were relied upon to be understudies or neighborhood group bunches. In 2004, the display experienced a noteworthy remodel of 80% of its shows. Upon its reviving on 3 December 2004, the Gallery was renamed the Singapore City Gallery. The Gallery's key display, the Central Area Model, was likewise extended to incorporate ranges which were in the past not appeared, for example, Orchard Road, Kampong Glam, Little India, Bras Basah, and Bugis. 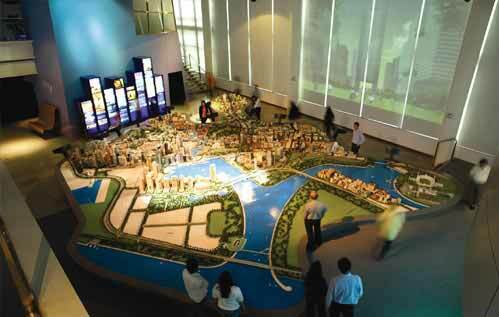 The model was likewise overhauled to incorporate the most recent arrangements for Marina Bay. In 2008, the Gallery got its millionth guest. In 2011, the display was updated once more, and revived in August of that year, to incorporate new shows, for example, a 270-degree scene of life in Singapore and a 8-player sight and sound amusement on urban arranging. This most recent variant won respects in the Singapore Design Award 2012 for both the Events/Exhibitions classification and the Multidisciplinary Design class. The Gallery now gets around 200,000 guests every year.